Samsung's new flagship Android smartphones, the Galaxy S6 and Galaxy S6 Edge, go on sale tomorrow at AT&T, Sprint, T-Mobile, U.S. Cellular, and Verizon Wireless and ship on April 10. Fortunately, we managed to get our hands on the shipping hardware in advance. The results of our evaluation: Both devices are major steps up for the Android ecosystem, marrying enhanced hardware capabilities, better security, and a cleaner user interface with a strong design derived from both Apple's iPhone 6 and HTC's One. But as good as they are, the Galaxy S6 and S6 Edge come with a few quirks and one apparent bug. 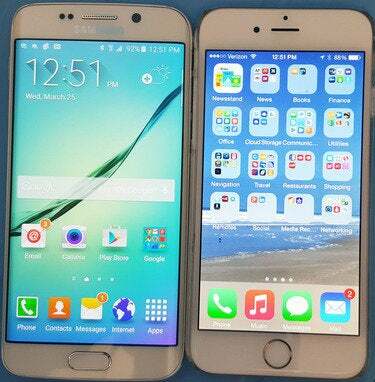 The Samsung Galaxy S6 (left) takes numerous design cues from the Apple iPhone 6 (right). The new Galaxy S6 devices have a much nicer feel and more thoughtful design than last year's plasticky, boorish Galaxy S5. Both have a decidedly Apple feel. Samsung is often accused of cloning whatever Apple does or is even rumored to be doing, and there's much truth to the claim. At first glance, either Galaxy S6 looks like a love child of the iPhone 6 and iPhone 5s, with metal and glass cases and an understated design. The key differences are the Samsung logo, the rectangular Home button, and the larger body and screen of the S6. The S6 Edge's curved screen helps it stands slightly apart. The glass back cover of the Samsung Galaxy S6 has a sensuously lustrous feel. Samsung's wide selection of bezel colors, which vary based on the carrier, will help some models stand out. The two Galaxy S6 models have a glass back -- which I missed terribly when Apple launched the metal-backed iPhone 5. Glass is warmer and smoother to the touch, so it feels more luxurious. The S6's glass back has a feathered edge, which means there's a slight curve at the edges, so it fits like a glove. There's something softer about the glass in the S6: It feels more like a high-quality resin, but without the risk of yellowing over time. Whatever Samsung did, it's a treat to touch. The new Samsung Galaxy comes in two models: the S6 and the S6 Edge. The Galaxy S6 Edge has curved glass edges that expose the left and right sides of the screen, similar to the Galaxy Note Edge. The regular Galaxy S6 has the standard flat screen, with an iPhone 6-like bezel on all sides. The curved edge displays are shallower than in the Note Edge, so there are no special status icons in the Galaxy S6 Edge. Instead, the edges help make some information more visible when the smartphone is resting on a table and you're viewing the screen at an angle. You get to choose what it displays: people icons (for as many as five individuals of your choice) and what form of contact causes their icons to light up -- missed calls, text messages, and emails. Tap an icon to see the recent communications from that person. The Galaxy S6 Edge's edge display (left) appears when you swipe the nearly invisible control (circled in yellow at right) on your home screen. The feature is not intuitive; there's a very thin line near the top right or left edge (based on your preference setting) that you swipe inward to display people's icons. You leave that view on, which means you no longer see the notifications tray while the S6 Edge is unlocked. On the Samsung Galaxy S6 Edge, a thin notification bar appears if one of your favorites tried to contact you. Swipe the bar inward to reveal the details, as shown here. There's another hard-to-see indicator on the same edge toward the bottom of the S6 Edge; it appears if you missed communications from one of the people you indicated as a favorite, using that person's color. Swipe it inward to see the details of what you missed. The Galaxy S6 Edge also lights the other side of the screen when the device is face down and receives a call. The idea is that you can turn off the ringer and still see that you got a call, although not who called. I don't find the edge info very useful -- the lock screen or notifications trays are usually visible even when I set the smartphone on a table, and they deliver more critical data. But the S6 Edge's curved edge provides a rounded feel that I find slightly more pleasant to hold than the regular Galaxy S6. It's not that the S6 is uncomfortable, but the S6 Edge is more comfortable. But others who tried the devices didn't like the S6 Edge's curved sides -- the edge felt too sharp to hold comfortably, and they had trouble typing on the keyboard where it flowed into the curves -- so be sure to try both models in a store yourself. 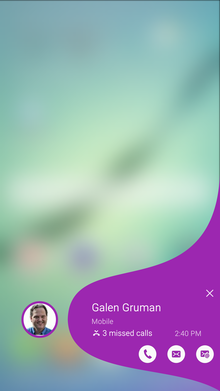 To get that curved screen and (if you see value in them) the edge notifications, I'm guessing you'll pay about $100 more for the S6 Edge -- unfortunately, Samsung won't release list prices, saying that's up to each carrier. Prices in Europe, though, suggest that the 32GB Galaxy S6 will cost about $750 when purchased outside a contract, and the 32GB S6 Edge will cost about $850. The differences between the Galaxy S6 series and the iPhone 6 become clearer as you use the devices. The new Google 5.0 Lollipop OS is cleaner, and Samsung has tidied up its version of the Settings app, so it's easier to navigate. 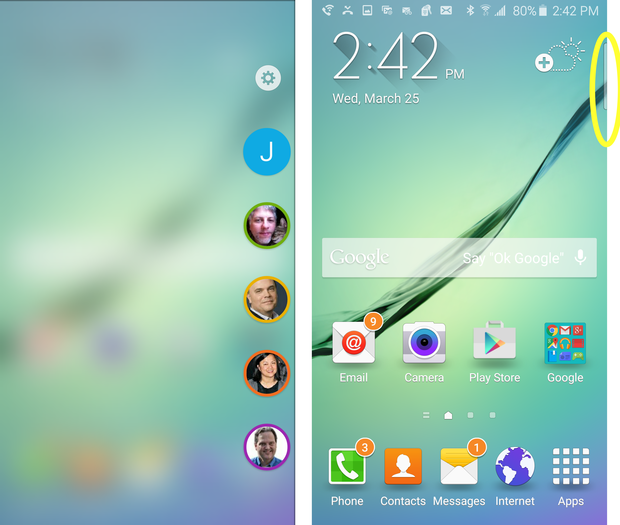 Lollipop is iOS 7-like in its flatter design, but it has a distinct look that Samsung has not messed with. The result is a more sophisticated yet distinct Android smartphone. You won't find any breakthrough technologies in the Galaxy S6 or S6 Edge, but you'll notice useful enhancements. Beyond the new processor and screen, most of the S6s' hardware enhancements debuted in the Galaxy Note 4 or Galaxy Note Edge. The biggest advancements are the Home button's fingerprint sensor and the Galaxy S6s' screen. The Galaxy S6 and S6 Edge smartphones are narrower than the Galaxy S5 or S4, and with the reduced size, they're more comfortable to hold. More important, the new devices are easier to operate because more of the screen falls within range of your thumb when using the smartphone in one-handed mode. Although they're slightly larger, thicker, and heavier than an iPhone 6, they have bigger screens, and they still beat the old Galaxy S5's dimensions. You'd expect a new smartphone model to be thinner. More interesting is the S6 screen, which seems to offer more natural color tones than previous Galaxy models, whose display colors appeared overly vibrant. The Galaxy S6 smartphones' 5.1-inch, quad-HD screen packs a ridiculous number of pixels, which I usually dismiss as a gimmick for the spec-obsessed. In this case, though, you can see the difference: The S6 screen provides very clear text and image detail. If you remember the wonder of the original Retina display in the iPhone 4, the Galaxy S6 makes a similar leap in image clarity and sharpness over the Galaxy S5 and is even sharper than the iPhone 6 and Samsung's own Note 4, which introduced the quad-HD screen to Samsung's lineup. That extra sharpness and resulting clarity may be due to a new antireflective material used in the S6 screen and to brighter backlighting. Samsung has also upgraded the heart of the Galaxy, by using a 64-bit Exynos processor of its own making, as well as beefing up the internal memory's speed and the amount of internal storage (now starting at 32GB, with 64GB and 128GB options to be available). Samsung says it has improved the S6 speakers. They certainly sounded louder, but also distorted at high volumes, as overdriven smartphone speakers often do. The S6 cameras have been beefed up, with an f1.9 lens on both the front and back cameras, versus the S5's f2.4 aperture. 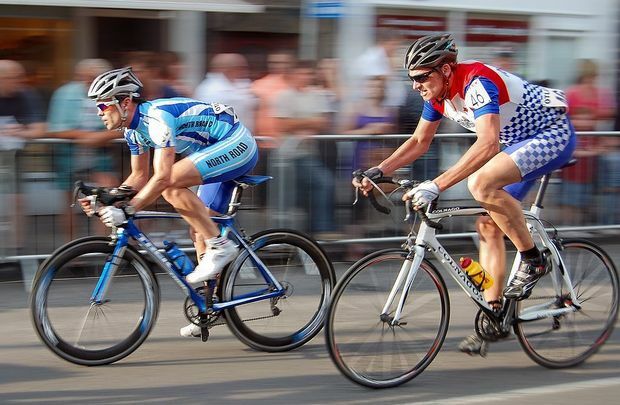 The wider aperture should yield improved image capture in low lighting. There are also more pixels in the rear camera's CCD versus the Galaxy S5: now 16 megapixels versus 8. The increase in megapixels may or may not improve the images captured, because camera software has more to do with image quality than raw pixels at this point. But my informal testing showed the S6 camera is as detail-oriented and color-accurate as the iPhone 6's, which is a good standard. I also tested two camera-related features. One is fast access to the camera, even when the S6 is asleep: Double-press the Home button to open the Camera app in less than a second. The other is the enhanced Camera app itself, which adds automatic HDR mode, so the Galaxy S6 can decide when to take pictures in high-dynamic-range mode (a decision better left to the camera than you). Sure, the iPhone 6 has automatic HDR, but the iPhone 6 can't take HDR photos if the flash is used. The Galaxy S6s can. Samsung claims the S6s have fast-charging circuitry, letting them charge to 50 percent capacity in 30 minutes when plugged into a power source. Samsung also claims that when using induction charging, the S6s can get to a 20 percent charge in 30 minutes. I couldn't verify the induction-charging claim, but I can confirm that the fast charging works as promised when connected to a wall charger. One note about fast charging: The fuller the battery charge, the slower the charging rate. In other words, you might get to 50 percent in 30 minutes, then need a couple of hours to get to 100 percent. But I'll take any speedup the fast-charging circuitry provides. The two Galaxy S6 models have lower-capacity batteries than what the Galaxy S5 sported: 9 percent less capacity in the S6 and 7 percent less in the S6 Edge. But Samsung says more efficient hardware and better battery management software will mean no loss in operating time. We'll see. It's clear that the Galaxy S6s drain their batteries faster than an iPhone 6 does -- about 20 to 30 percent faster -- unless you enable the power-saving feature in the Galaxy S6s' Settings app. It's a fact that the hardware and software matter more than raw battery capacity to determine battery life, as iPhone users can attest: The iPhone 6 has 30 percent less battery capacity than the Samsung Galaxy S6s, but the iPhone easily operates longer on a full charge. The Galaxy 6 and S6 Edge are missing two hardware features, which may anger some Galaxy fans: There's no SD card slot to add storage capacity, and the battery is not removable. The new S6s come with at least 32GB of storage and are available with as much as 128GB, so the lack of SD card is not an issue if you buy your capacity amount wisely upfront and/or move your files to the cloud periodically. The Galaxy S6s have reasonable battery life, especially with the battery-saver option enabled in Settings. And these days, is a charger ever that far away? Still, Android battery life is inferior to that of the iPhone, so there could be days you're out of juice and don't have a power outlet for your MicroUSB charger. That's a rare occurrence on my main smartphone, an iPhone 6, but even for that battery-sipping device I carry a portable battery-based charger just in case. You should too. The Galaxy S6s use a new touch-style fingerprint reader in the Home button, similar to Apple's Touch ID on an iPhone or iPad. It's much more accurate than the previous swipe-style fingerprint reader used in the Galaxy S5, Galaxy Tab S, and Galaxy Note 4 -- which was notoriously unreliable, to the point of being unusable. But the new touch-style fingerprint reader in the Galaxy S6s is still not as accurate as the ones Apple supplies in its iPhones and iPads. It's particularly bad at detecting fingerprints if your finger is even slightly canted to one side, which Apple's reader easily accommodates. As a result, you'll have to tap twice more than half the time on the Galaxy S6s to get your fingerprint recognized, versus maybe one time on Apple's devices. That's still way better than the previous Samsung fingerprint scanner, which got it right maybe one out of 10 times.